As consumer interest in tea grows—four out of five U.S. consumers drink tea, according to the Tea Council of the USA—brands like PepsiCo and Unilever's Pure Leaf have a big opportunity to drive awareness. And that's what Pure Leaf is doing, with the debut of its first television spot on Monday. The new ad, by the brand's creative shop Anomaly, is part of a push by Pure Leaf to highlight its product as "real, leaf-brewed tea" compared to competitors who add "unnecessary ingredients." 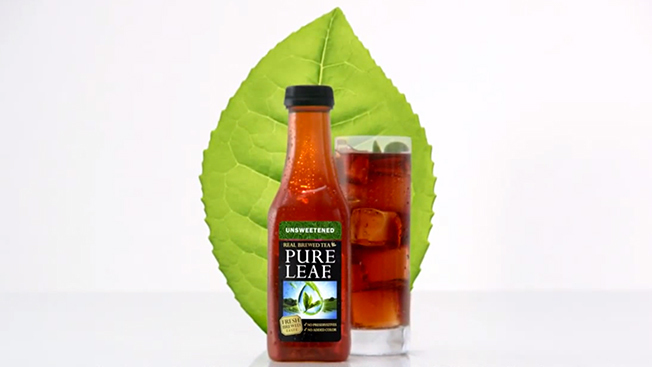 "We re-launched the Pure Leaf brand in 2012, and we've seen significant growth since then," said Linda Bethea, senior director of marketing for the Pepsi Lipton Tea Partnership. "The tea category has been growing, and we know there's a huge consumer trend for realness and authenticity, and that's exactly what Pure Leaf is offering." That growth, according to Beverage Digest data, shows bottled and canned teas up 3.5 percent in the past year. PepsiCo, with brands like Lipton and Brisk as well as Pure Leaf, has a 40 percent share of the category, up 7.9 percent from 2013. The Pure Leaf ad was designed to showcase how the brand grows its leaves and brews its tea through the journey of one individual leaf in 15- and 30-second spots. The campaign also includes print and digital, and the brand has a redesigned website. Pure Leaf is also partnering with Top Chef judge Gail Simmons, who has created recipes to go along with the tea.